Offer yourself a ski-coach ! Modern equipment makes skiing easier, however a correct technique is seldom acquired without professional help. 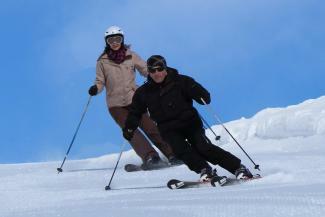 For safer, pleasant skiing , on groomed slopes as in deep snow, professional coaching can make the difference. As a fully licensed ski teacher, with a professional background of almost 3 decades, I am presently based in Crans-Montana, but I am ready to meet you in your favorite resorts. video analysis is included in our services, when desired.